We spent the past weekend in Charleston, SC for a friend’s wedding. While there wasn’t much time for culinary expeditions, we did manage to have two good meals out. 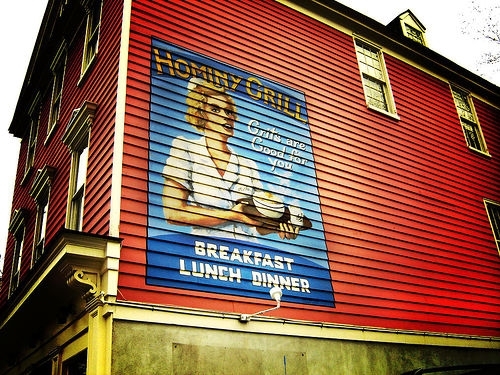 The first was a dinner at the famed Hominy Grill. Located in a nice old building on the North end of town, with a lovely patio, the restaurant is a mostly successful mash-up of the down-home and the moderately upscale. The food is respectable, if not great. I had a southern-fried chicken breast, which was succulent and moist, ensconced in a thin crispy fried shell. It was supposed to come with a country-ham gravy, but this element was nearly absent and added nothing to the nicely executed chicken. The accompanying mac & cheese was just ok, but the mashed sweet potatoes were so pasty as to be borderline inedible. My wife had the “big nasty biscuit” – a monstrous fried chicken biscuit with cheddar and sausage gravy. It suffered a bit from a shortage of sausage, and the cheddar was actually pimiento cheese in the gravy, but still it tasted pretty good. A side dish of tomato pudding – described by the waiter as “tomatoes, cornbread, and sugar – baked” was addictive. My dad had one of the “house specialties”: shrimp & grits. While this is undoubtedly a famous South Carolina dish, and our expectations were high, I’ve had better renditions at Crook’s Corner and Piedmont. For dessert, we shared a fantastic peach pudding – a sort of cobbler/bread pudding hybrid, and a lighter than expected slice of chocolate-pecan-caramel cake. Better still was our lunch the next day, at the Cru Café. The restaurant is tucked away in a beautiful old house on a quiet street near where seemingly all of the city’s hordes of horses make their home. If the outside is charming with its lovely front porch, the inside of the restaurant is equally as gorgeous – wood floors, old fireplaces, ultra-high ceilings, cozy seating. I had a difficult time choosing from the menu, but eventually settled on a beef brisket sandwich. It arrived as a hamburger bun piled high with thin sheets of ultra-tender beef, slathered in a delicious, mildly spicy orange bbq sauce. I didn’t care much for the accompanying coleslaw, but I don’t care much for any coleslaw. The sandwich was fantastic. My wife had the French dip, which was nicely done if a little bland and mushy. She reported that her side salad was excellently dressed. My mom had the shrimp BLT, a dreamy combination of its namesake components with pepper jack cheese on rustic bread. It was superb, and big enough to easily feed two people. Combined with the food, the setting and ambience make this gem a perfect neighborhood café. If you haven’t been, get thee to Charleston and delight in the city’s beautiful architecture and terrific food scene.